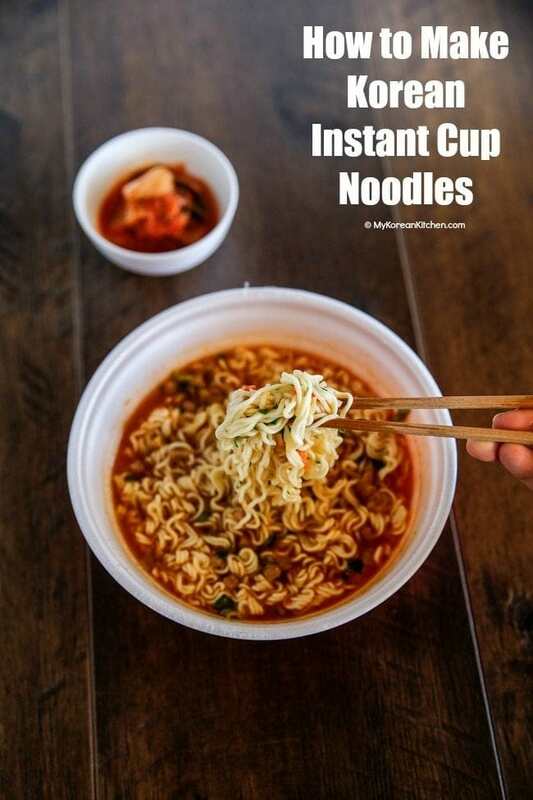 Easy, delicious and addictive Korean instant cup noodles! 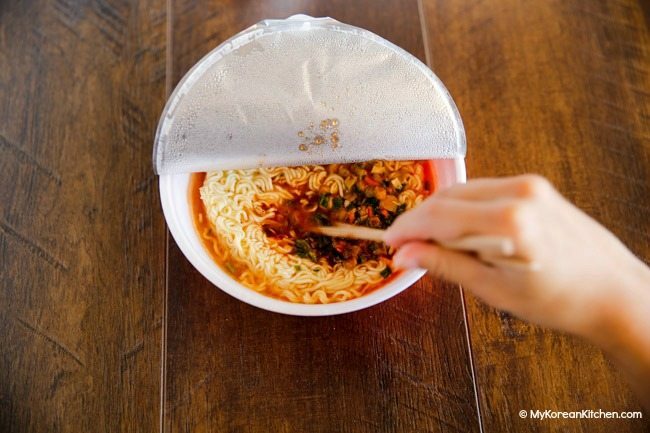 Korean instant cup noodles are very popular particularly among teenagers in Korea. I know it’s not a healthy meal choice but every now and then I do have this urge to have instant cup noodles! Don’t you? These particular times for me are on a rainy day or when I see someone eating it on the TV. They just make the noodles so darn delicious! In my opinion, instant cup noodles give a different feeling of joy compared to regular instant noodles. The noodles are thinner and they tend to be bouncier, which I really love! 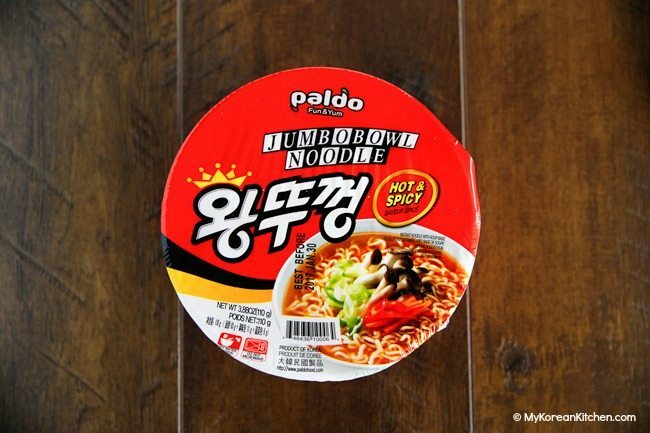 I will be demonstrating this with one of my all time favourite Korean instant cup noodles – Wang Ddukkeong (왕뚜껑). It literally means King (sized) lid. Yeah, this cup noodle container is by far one of the largest around. This brand has been around as long as I can remember (25+ years at least!) and it’s pretty tasty too. If you haven’t tried it, you should! Also tell me, what are your favourite cup noodles brands? And do you have your own secret way to enhance the taste? Tear open half of the paper/plastic lid. (Some brands may have a dotted line as an indicator.) Add the powdered sauce (from packet 1) and dried vegetables and meat (from packet 2). Pour some boiling (100 C/212 F) water up to the inside line of the container. 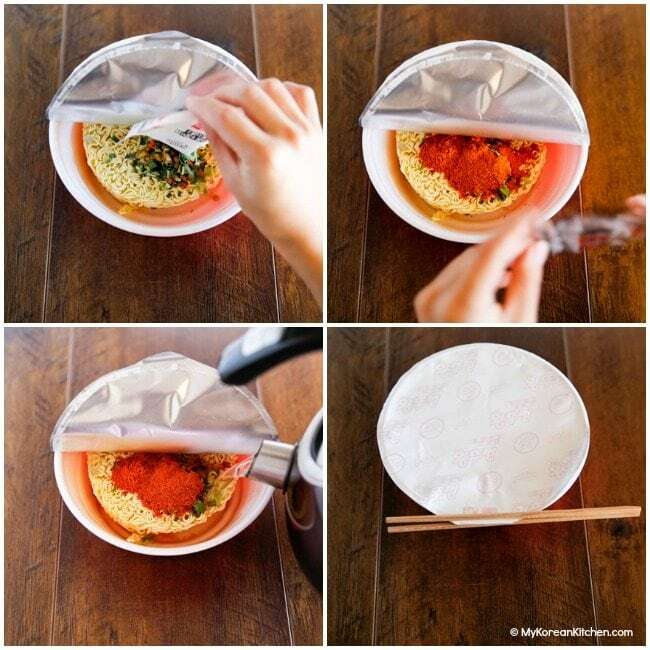 Put the lid on and weigh down the lid with a set of chopsticks or a light plate. Wait patiently for 2 to 3 minutes then stir the noodles well with chopsticks. Dig in! Update: This post was originally written on February 14, 2007 and now it’s updated with new photographs. 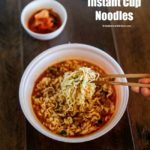 Easy korean instant cup noodle recipe! Love the blog – thanks! 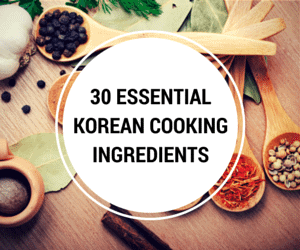 I haven’t done much Korean cooking other than basic stuff, but am looking forward to using your blog as a springboard to do more! I must say that King Lid is my favorite instant Ramyeon. Everytime I go to the PC room, I eat one of these. If the PC room has the yellow radish, its even better! They even came out with the smaller size ones. Not enough for me but it’ll do well for the ladies. That’s OK as long as you give me the credit, like you said. I’m Raewyn and as part of one of my internal paper US5940 for computer studies at Howick College I have decided to base my presentation using a desktop presentation computer application on how to make cup-a-noodles. 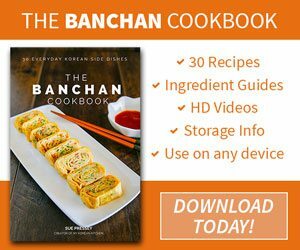 I have looked through your recipe and its great!I was wondering if I could have your consent to use your method and images on how to make a cup-a-noodle. Please reply me back with your consent. oohhh never seen this brand before. will try and find it at the grocery. ^^ hehehe i usually have shin or nongshim kind that i see a lot. those are yummy. my comfort food. Yoo, here is the recipe. 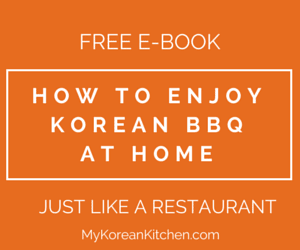 sue, by any chance .. do you know how to make bossam? beloved, that is too bad. I hope the situation changes soon so you can spend good dinner time together. lao-ocean-girl, adding some crab sticks are a good idea. I like eating them a lot. For cup noodles, I’ll put pieces of fake crab and break a raw egg into the cup before pouring hot water into it. I make sure to break the egg up so it can have a chance to cook. beloved, did you really have shin noodles for valentine’s dinner? It is not very festive though 🙂 Yet I didn’t cook either. We ate out at a Chinese restaurant – stir fried rice and sweet and sour pork – with other friends. mona, I don’t eat them often either. I usually eat them after I watched someone on the movies. Korean movies seemed to have a lot of scenes with cup noodles. John, I used to eat migorang when I was poor too. 🙂 It is really cheap but it was very salty indeed. I haven’t had Kamja ramyun and twigguim udong yet. I should try them soon. Sally, That is one reason why I try to avoid watching TV just before I go to sleep. pablopabla, that’s cool. It should be healthier too. I love to eat cup noodles. And I totally agree with you! I always crave them when I watch someone on TV eating. In Brisbane MiGoreng were the cheapest(40 cents in Chinatown) but,darn they’re salty.When I was poor(still am^^)I’dhave noodle sandwiches with a thickslice of no-name cheddar cheese.Great stuff. My favourite Korean noodles are Kamja Ramyun-nice and chewy. Udon are pretty neutral in taste and I like to cook up a vegetable stock with garlic,onions,broccoli,a little mirin and Kikkoman soy sauce and put in the noodles right at the end.Don’t need to cook them,just heat them through. hehe. i don’t eats these so much any more. but i have fond memories of standing up at the counter of the corner Family Mart slurping down a bowl before heading in home. I like ramen, but I’m not a big fan of cup noodles. I like to add veggies and an egg to my regular ramen but with the cup kind, the broth is too watery for me. Also, I don’t like the noodles in them as much. It’s a cold, snowy Valentine’s Day here and I’m considering some ì‹ ë¼ë©´ for dinner.